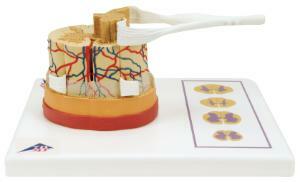 This spinal cord model illustrates the composition of the spinal cord, magnified to a scale of 5:1. The base of the model features illustrations of the various cross-sections of the spinal cord through the white and gray matter at the neck, torso, lumbar, and sacral regions. This model is supplied with a base.